OK, Mud Shuckers, we’re hitting the Muddy Branch Trail on Saturday. Not quite starting our Summer Training yet but, hey, isn’t every run a training run of sorts? It looks to be a tad bit warm on Saturday so hydrate and munch those salt tabs and electrolytes. We’ll put some water out on the course for refills. We are meeting at a new place so we can easily park a group and not have to spend any time on pavement (except, o…f course, that dang 1/3 mile slab of asphalt called Esworthy Road!). It will be a short hop from the parking lot to the mid-point of the trail. There will be different mileage options, North and South, which we’ll explain in the a.m.
* Check out our Muddy Shoes merch! We got Hats ($15), Buffs ($10) and magnets ($1). They are going fast! Get yours from Robin (Hats), Phil (Hats, Buffs, Magnets) or Mike Chau (Buffs). No Bitcoins! US Dollars only! * Got Summer running plans? 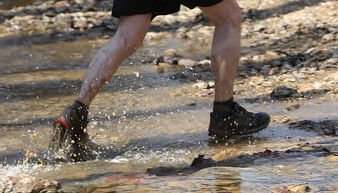 Well, we’ll be kicking off the Muddy Shoes Summer 25/50k Training Program on Saturday May 19th. Its low-key but awesome! Target race is the MD HEAT 25/50k in August. Stay tuned for details coming your way. Cost? Just slide a ten spot ($10) and your in! Thats cheap!